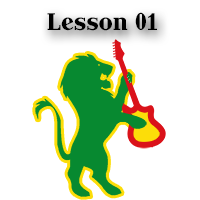 This reggae guitar lesson is being played the fingerstyle way. That makes it stand out. But why exactly is it unique? Well, not only because it comes with a TAB. It’s because you don’t often see people attempt to play reggae as a solo guitar style. I think that’s enough self-boasting for today, let’s get to the lesson itself. It’s a simple, short lesson to show you the basic pattern. I just put a catchy little melody line on top of it, so you have something to build upon later, when you get the hang of it. So, let’s begin with the picking hand. The biggest trick in this kind of playing is to have the rhythm pattern down. It takes time to internalize the sucker, but it’s worth the effort. The first part of it is the constantly pumping bass notes on the bottom strings. They are played with the thumb. Duh! The second part is the down strokes, played with the back of your fingernails on the rest of the fingers. The third part is to create the melody. 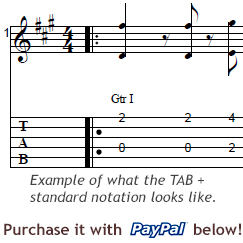 The melody notes can fall either when there are rhythm down strokes, or between them. So when they are under the rhythm notes, they get sounded automatically. And when they are fall between these strokes rhythmically, you just pick them regularly, with your fingers. Sounds easy, hey? Well, it is, once you don’t have to think about it anymore. I still do. Just kidding. The fretting hand plays the usual, versatile barre chord shapes. Whenever the melody requires a note that’s not part of the chords, the pinky saves the day. Moving the pinky around to reach for all kinds of notes is an obvious and useful thing on guitar. Of course it feels pretty uncomfortable at first. But trust me, it becomes part of your chops real quick. Just don’t be scared of making mistakes and those pesky buzzy notes when you try doing it first. Soon you’ll get it perfectly. In a couple of years. Hehe. In the middle and in the end of the piece, the thumb plays a little bit busier part than the quarter notes throughout the song. This bass figure can be learned as a part of this solo reggae pattern. Then when you create tunes that have a couple of emptier parts, just play the denser bass in the bottom. That way, the arrangement can remain fuller and sound more orchestral, if you will (more like a real band). ← Previous Previous post: Simulate reverb with delay in the mix!